In the wake of the record-shattering success of his two previous films, "Jaws" and "Close Encounters of the Third Kind," Steven Spielberg was in a position where he could pick practically anything that he wanted to choose for his next project and the studios would be clamoring to make a deal with him. For that follow-up project, he decided to shift gears from his previous efforts to try his hands at broad comedy by acquiring a screenplay from Robert Zemeckis & Bob Gale, the writing duo whose earlier project, the Beatles-era comedy "I Wanna Hold Your Hand," he had previously produced as Zemeckis's directorial debut, that would eventually be called "1941." Loosely inspired by a couple of actual incidents that occurred in Los Angeles in the immediate wake of the attack on Pearl Harbor and set one week afterwards, the film pursued a number of different storylines that involved war nerves, missed communications, young love, downright craziness and a Japanese submarine lurking off the California coast infecting the area and leading to mass hysteria, riots, dogfights over the city and a torpedo attack on a seaside amusement park. 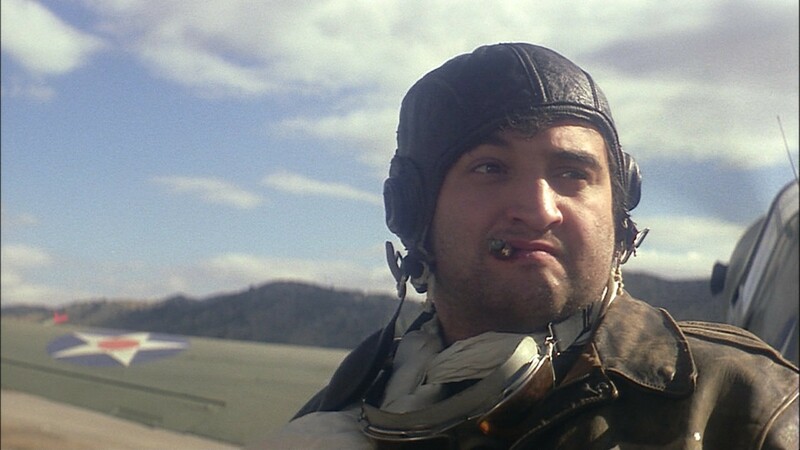 With an all-star cast featuring the likes of John Belushi (as a crazed P-40 pilot obsessed with downing Japanese planes, even if they aren't actually any around), Dan Aykroyd (as a tank commander whose crew includes the likes of Treat Williams, John Candy, Frank McCrae and a then-unknown Mickey Rourke), Ned Beatty (as an ordinary homeowner obsessed with putting the anti-aircraft gun placed on his lawn to good use), Bobby Di Cicco (as a dance-happy civilian who unexpectedly finds himself pressed into service), Warren Oates (an insane commander convinced the Japanese are landing spies in the Pomona alfalfa field), Robert Stack (as the real-life General Joseph Stillwell, one of the only two voices of sanity amidst the chaos), Tim Matheson (a smooth-talking military aide whose attempts to seduce plane-obsessed Nancy Allen precipitates an air battle over Los Angeles), Toshiro Mifune (as the Japanese sub commander and the only other voice of reason), Christopher Lee (as the imperious Nazi along for the ride on the sub) and a wide array of familiar faces in supporting roles (including Elisha Cook Jr., Lionel Stander and the legendary Slim Pickens) or cameos (look for Penny Marshall, James Caan, Michael McKean, David L. Lander and Joe Flaherty, among others) and produced on a scale not seen in a straightforward comedy since "It's a Mad, Mad, Mad, Mad World," everyone assumed that "1941" would be a huge hit but when it premiered in December 1979, that was not the case. Critics largely drubbed it for being too noisy (even the John Williams score included cannon fire in its orchestration), too scattershot and simply not funny enough for what was being billed as the funniest film ever made. While it eventually made enough money to generate a small profit (it was said to have been extremely successful in Japan, go figure), it never really caught fire with American audiences and went down in the history books as the great Spielberg's first flop. And then, in a development as crazy as anything seen in the film itself, the reputation of "1941" began to slowly improve. Much of this had to do with the creation of an Extended Edition for television and home video that included 26 additional minutes of previously unseen footage, most of which had been in Spielberg's original cut until the film underwent a last-second reedit in the wake of a couple of unsuccessful test screenings, that helped flesh out the characters and the transitions between the various storylines and added a number of big laughs to boot. 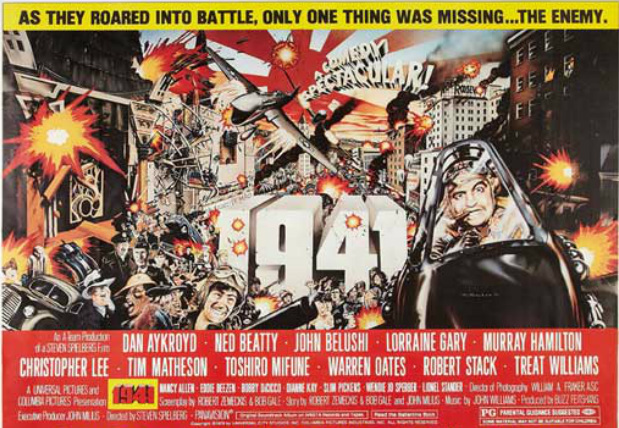 Now presented in its intended version and without the negative publicity surrounding its release, people could finally see "1941" for what it was--one of Steven Spielberg's finest films (I would rank it just beneath "Jaws" and "Duel" as my favorite of his works) and one of the greatest examples of knockabout comedy in cinema history. Virtually every scene contains some kind of spectacular image brought brilliantly to life by Spielberg and his army of technicians and some of the sequences on display here--especially the intricately choreographed jitterbug contest, one of the closest approximations to a live-action cartoon ever produced, and the alternately gorgeous and ridiculous image of a Ferris wheel rolling down the Santa Monica pier into the ocean--are breathtaking to behold no matter how many times one sees them. The screenplay by Zemeckis and Gale is also far more clever than it usually gets credit for--the combination of cheerfully cynical humor and goofball revisionist history that they would later present in a far gentler manner in the "Back to the Future" films was especially inspired here. More impressively, amidst the chaos, their depiction of the paranoia and xenophobia that can grip a seemingly normal population in the early days of armed conflict is something that continues to resonate strongly to this day--in fact, their observations of the depths that people can sink to in times of trial before eventually pulling themselves together may be one of the reasons why it was initially rejected by moviegoers. (Not just moviegoers--both John Wayne and Charlton Heston were offered the role of Gen. Stillwell and turned it down believing the screenplay to be unpatriotic.) If nothing else, the two should be celebrated in the annals of screen history for writing a movie that not only brought the disparate likes of Toshiro Mifune, Christopher Lee and Slim Pickens into the same scene but contrived to having them do lowball comedy schtick for good measure. After years of anticipation, "1941" is finally making its Blu-ray debut as part of "The Steven Spielberg Collection," an 8-film set that also includes reissues of "Jaws," "E.T.," "Jurassic Park" and "The Lost World" and the format debuts of "Duel," "The Sugarland Express" and "Always," in a version that includes new transfers of both the original 1979 theatrical version and the later extended edition, a fabulous 2-hour documentary detailing the production history and numerous deleted scenes. To promote the release of the set, co-writer Bob Gale got on the phone to discuss the creation of "1941," its dismal reception and its eventual recognition as a genuine comedy classic. "1941" is very loosely inspired by a couple of real-life events that occurred in the Los Angeles area in the period following the attack on Pearl Harbor. Where did the idea come to transform these incidents into a screenplay and, more importantly, what led to the decision to utilize such a broadly comedic approach? There were three incidents that were the impetus for it. First, there was a Japanese sub that actually shelled the coast of Santa Barbara. It didn't do any damage but the appearance of the sub precipitated two nights later the false alarm air raid over L.A. Finally, the next year saw the Zoot Suit riots in L.A. It was all of those things mixed together and the reason that it had to be a comedy was that the whole idea that for six straight hours that night in February, 1942, anti-aircraft crews were shooting up at the sky at nothing was funny--at least to our kind of warped sense of humor. We knew that if this was going to be the subject of a movie, it had to be this comedy of people misinterpreting everything in a comedy of errors with crazed people in pursuit of their goals that results in this night of total mayhem. Was the gigantic scale of the story and its various setpieces something that was there from when you and Robert Zemeckis were first writing the screenplay or did it grow in scope later on in the process? We were really young and exuberant and ignorant. We would think of this stuff and say "Yeah, we could have a dogfight on Hollywood Boulevard--let's write that in!" or "We could put riots on Hollywood Boulevard--let's do that!" or "We could have a Ferris wheel roll down the Santa Monica pier--let's put that in there!" without ever thinking about how these images would or could be put on the screen. We just thought it would be great to see this stuff and we were fortunate that the script fell into the hands of one of the few guys in Hollywood at the time who could put those images on the screen. I think the fact that the script was so exuberant and insane on that level was what attracted Steven because I don't think there were many other screenplays floating around at that time that were doing that kind of crazy stuff. The film has this huge cast consisting of big-name stars, veteran character actors and then-unknowns in early roles--Mickey Rourke made his screen debut as one of the members of the tank crew--and even the list of people who turned down roles was pretty illustrious--both John Wayne and Charlton Heston declined to play General Stilwell, supposedly because they found the whole thing to be unpatriotic. Were there any roles where you guys had certain actors in mind when you were writing them? There was one place where we did have an idea. When we were writing the two guys on the Ferris wheel, we, being big fans of "The Honeymooners," described the characters by saying that one of them looked like a bus driver and the other looked like a sewer worker in the hopes of getting Jackie Gleason and Art Carney to play those guys. The casting director sent the script to Jackie Gleason but Gleason said that he would just not work with Art Carney anymore, which was a devastating thing to hear. Other than that, no, we didn't really have any sense of who these characters were going to be. We had made "I Wanna Hold Your Hand" and so the film has four alumna from that. 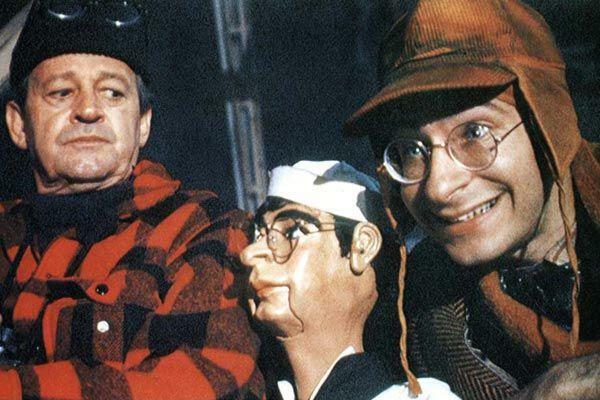 I don't remember if that was Steven's idea or our idea or an amalgamation to put those actors in the movie but when you see Eddie Deezen in "I Wanna Hold Your Hand," you just want to put him in something else and have that lunatic thing going on. Steven was using veterans from his own movies--he's got Murray Hamilton, he's got Lorraine Gary, he's got Lucille Benson. Everyone in Hollywood was talking about how Steven was making one of the biggest movies ever and all these directors and producers and movie stars would come down to see what he was doing. One day, James Caan came down when he was shooting the riot and I don't know whether it was his idea or if Steven asked him if he wanted to throw one of the first punches but he is in the movie. Coming on the heels of Spielberg's enormous success with "Jaws" and "Close Encounters of the Third Kind," combined with the huge popularity of John Belushi and Dan Aykroyd from "Saturday Night Live" and an avalanche of hype, "1941" was expected to be another massive hit but when it came out in December, 1979, it was critically drubbed and while it was not the total flop that some claimed it to be, it was nowhere near as popular with audiences as had been expected. What was your reaction to that initial reaction--did you find yourself wondering what you had done wrong or were you thinking that it was everyone else who was wrong? Well, the theatrical version of it is flawed because a lot of the backstories of the characters and the connective tissues of the story ended up on the cutting room floor, which is why it is great that the extended version was created and exists on this Blu-ray. I certainly understood why a lot of people had a hard time with it. At the time, Zemeckis and I were doing "Used Cars," so we didn't really have much time to think about it or react--we were trying to make our own movie. We had been to one or two sneak previews while we were in pre-production but we certainly didn't have a lot of input into the editing process. Steven was also kind of scrambling to make his release date--it was a hard December release date and there was no way that the studios were going to say that he could spend a couple more months editing in order to refine some of the stuff better. I think it was a combination of all of that stuff that made the movie what it was and I am just grateful that the other footage wasn't destroyed and that it could be restored into this new version. In the years since its original release, "1941" has seen an upswing in its reputation and has now developed a solid cult following. Do you have any theories as to why it plays better with audiences these days--did it just come out at the wrong time or are current audiences more used to films with multiple narrative threads than they were back then or does it just play better now that it has be restored to more or less what it was originally intended to look like in the extended version? Some of it is because of that but there are a lot of people who love the theatrical version as well. It is also a question of what expectations were back in 1979. We had Steven, who had just come off of "Jaws" and "Close Encounters," which were these home runs, and here he does "1941," which, although the critical perception was that he had struck out, was actually profitable--not hugely profitable but a single or maybe a double. I think that over the years, when people looked at the movie on its own instead of comparing it to a person's other work or what else was going on at the time, you can look at it differently. People caught up with the movie later on on television or home video and were able to react to it based simply on what was there and not what the expectations were at the time. Plus, there were a lot of people who had heard that it was a big disaster and when they watched it, they saw that it wasn't terrible by any stretch of the imagination and that there was some really funny stuff in it, some great production values and some of the greatest miniature work ever done. Do you have a particular favorite moment from either version of "1941"? God, I love the dance sequence--it is so great. I love all the miniature work like in that dogfight over Hollywood Boulevard. The biggest surprise for us when we saw the movie was the gag where General Stillwell sits in the theater watching "Dumbo" and he is crying during the "Baby Mine" scene. God, Robert Stack was so good. We didn't think that it was going to work but I laugh every time I see it. In addition to its Blu-ray release, "1941" will be screening in 35mm at Chicago's Gene Siskel Film Center on October 25 and 28 as part of "The Unquiet American: Transgressive Comedies From The U.S.," a program of films curated by noted film critic Jonathan Rosenbaum, who will be introducing and discussing the film at the October 28 showing. Sundance Report: "Skeleton Twins" and "The One I Love"